He has led the Tata Group to the very top. It is now the country’s wealthiest, with a market value of about Rs 3.71 lakh crore, higher than that of business houses led by the two Ambani brothers. Now, thanks to a retirement-at-75 rule he introduced earlier, it’s time for him to bid goodbye to the empire that he has taken to such heights. Some of the very people who protested when he took over as chairman of the Tata Group in 1991 now don’t want him to retire. Ratan Naval Tata must have a wry smile on his lips, as he has had a history of letting his work speak in a manner that confounds his critics. Ratan Tata, born on December 28, 1937, has shaped the destiny of an empire that is now global, and has business interests in sectors as diverse as cars, chemicals, salt, steel, software, trucks, tea and telecommunication. In most of them, they hold the top or number two position, since Tata products are know for quality and the group for it probity. The man who gave India the Nano shuns the spotlight, yet he is often in one. As he prepares to hand over the reins of the House of Tatas, Ratan Tata has every reason to look back at his innings with satisfaction. The group took a bold step by acquiring global companies like the biggest European steel company, Corus, and car manufacturer Jaguar Land Rover. He was criticised at the time and, in fact, told Sunday Times, London: “Both the acquisitions were made, I would say, at an inopportune time in the sense that they were near the top of the market in terms of price.” Yet, he has succeeded in opening new markets for Tata Motors in the luxury segment from Europe to China. Tata Motors cannot make enough cars to meet the demand. The group’s Bombay House headquarters is also monitoring the other big acquisition, Corus or Tata Steel Europe, hoping to show results by December 2012, when Ratan Tata formally calls it a day. 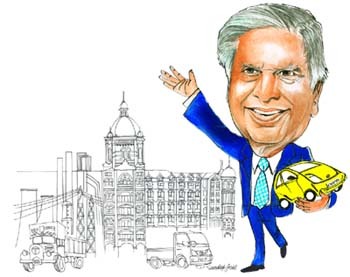 Very much destiny’s child, Ratan Tata was not born to great wealth — far from it. His parents, Naval and Soonoo, separated when he was seven and it was only after his grandmother, the redoubtable Lady Navajbai Tata, adopted him and his younger brother, Jimmy, that their fortunes changed. Rattan studied at Campion School in South Mumbai’s Colaba before moving to Cathedral and John Cannon School in the nearby Fort area. He once told an interviewer that he did not particularly enjoy school. “Most of us were forced to have tuitions after school, whether you wanted it or not. Life was quite a drudgery in those days,” Tata said at a reunion of Campionites earlier this year. In a clear indicator of things to come, Tata chose physics over chemistry and showed an aptitude for French and English literature. After school, Ratan went to the US and did his BSc degree in architecture with structural engineering from Cornell University in 1962. He was offered a job by IBM, but he turned it down on the advice of JRD Tata. By the end of 1962, he had joined Tata Steel — at the bottom, shovelling limestone and handling the blast furnaces at Jamshedpur. In 1975, he did the Advanced Management Program from Harvard Business School. He donned JRD’s mantle in 1991, and the Tata Group of companies has grown into a global conglomerate with revenues grossing US$70 billion or almost 7 per cent of India’s gross domestic product. So far, the group has made around 35 acquisitions around the world. Timing and vision both played their part in the group’s phenomenal growth. The Tatas, an inward-looking group ever since founder Jamsetji Tata unfurled the banner more than a century ago, made an about-turn under Ratan Tata to embrace globalisation. He was fed up with the bureaucratic red tape prevailing in India and chose to look outwards, like scores of Indian businessmen who went abroad to find fame and fortune. Tata’s initial forays outside India were jeered at as much as his stepping into the shoes of the legendary JRD Tata two decades ago. Everything from his management skills to his personality and lifestyle choices came in for close scrutiny. Simultaneously, Ratan Tata went hammer and tongs opening new market segments within India itself. Here again, Tata Motors led the way with the Indica followed by the Ace, a low-cost mini truck, and finally, the Rs 1-lakh Nano, which created global headlines, including when he pulled out of Singhur rather than face political arm-twisting and moved the plant to industry-friendly Gujarat. technology that promises to bring hygienic water to Indian villages. In 1991, Tata companies were a bunch of fiefdoms with only the Tata brand name binding them together. Ratan Tata unseated the satraps, including Russi Modi of Tata Steel, Ajit Kerkar of the Taj Group of Hotels and Darbari Seth of Tata Chemicals — one after the other — fully backed by his mentor, JRD Tata. Ratan Tata had been thoroughly tested before he was anointed successor to JRD. He faced many challenges as the head of troubled electronics maker NELCO, which he could not turn around till he changed the focus and turned from manufacturing radios and televisions to industrial equipment. As vice-chairman of Telco — as Tata Motors was then known — he tackled the unions in true Tata-style, with little pain. But then, not everything goes as planned. Dilip Pendse, the then managing director of Tata Finance, was accused of carrying out insider trading. He dragged in Ratan Tata’s name into the affair, causing much embarrassment to the group. Tata Sons, the holding company of the entire group, ploughed in nearly Rs 700 crore to prevent losses to depositors and shareholders of Tata Finance. The Singhur fiasco left its mark on the group, too, and the cosying up to Gujarat Chief Minister Narendra Modi did raise eyebrows. The Tata Group has set new standards of corporate responsibility. After the terrorist attack on the Taj, Mumbai, the group’s flagship hotel, the company gave a compensation package that was far more generous than anything the country had seen. Not only employees, even those who had nothing to do with the Tatas -- railwaymen, policemen and pedestrians — were given an allowance of Rs 10,000 for six months. As he said at the AGM of Tata Consultancy Services, the largest software company in the country, earlier this month: “We are also human and we must move on. Others should get a chance to take our place.” Ratan Tata will retire to his book-lined flat to spend time with his books and his dogs but what next? We will find out when the man, who has scripted an extraordinary life so successfully, wants us to know.